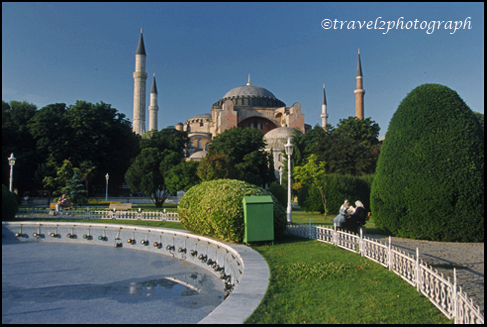 Hagia Sofia is a former patriarchal basilica, later a mosque, now a museum, in Istanbul, Turkey. 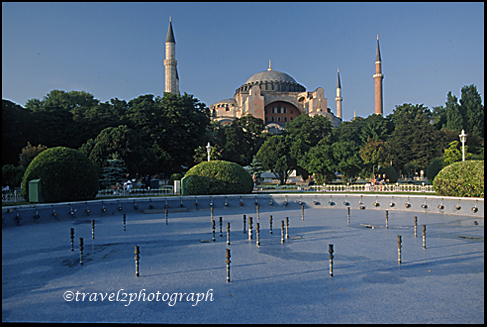 Famous in particular for its massive dome, it is considered the epitome of Byzantine architecture. It was considered the largest Christian Church in the world for nearly a thousand years, until the completion of the Medieval Seville Cathedral in 1520. The current building was constructed as a church between 532 and 537 AD on the orders of the Byzantine Emperor Justinian, and was in fact the third Church of the Holy Wisdom to occupy the site. It was designed by two architects, Isidore of Miletus and Anthemius of Tralles. 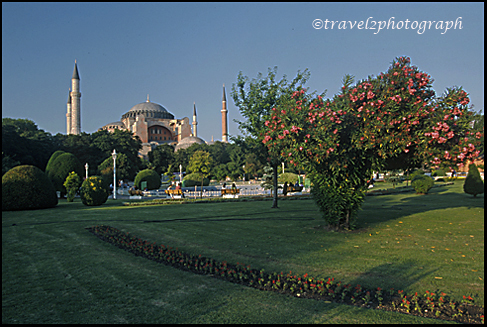 Hagia Sofia contained a large collection of holy relics and featured, among other things, a 50 ft. silver iconostasis. It was the patriarchal church of the Patriarch of Constantinople and the religious focus point of the Eastern Orthodox Church for nearly 1000 years. 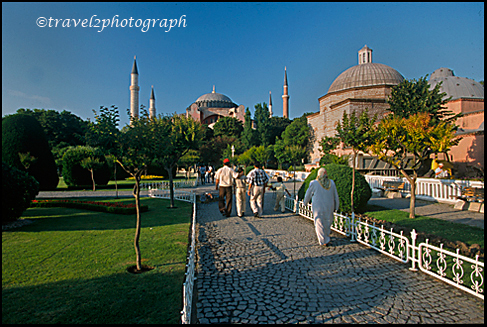 Hagia Sofia or Holy Wisdom is the mother church of all Eastern Christians of the Byzantine liturgical tradition both Orthodox and Greek Catholic. Architecturally the grand basilica represented a major revolution in church construction in that it featured a huge dome which necessitated the implementation of new ideas in order to support the weight of this dome, a feat which had not been attempted before. The dome which became universal in Byzantine church construction represented the vault of heaven thus constituting a feature quasi-liturgical in function. In the days when there was no steel used in construction, large roofs and domes had to be supported by massive pillars and walls. The dome of Hagia Sofia was supported by four piers (the solid supports from which the arches spring), each measuring about 118 square yards at the base. Four arches swing across linked by four pendentives. The apices of the arches and the pendentives support the circular base from which rises the dome which is pierced by forty single-arched windows which admit light to the interior. The church itself measures 260 x 270 feet; the dome rises 210 feet above the floor and has a diameter of 110 feet. The nave is 135 feet wide, more than twice the width of the aisles which measure 62 feet. Because Constantinople lies in an earthquake-prone region, the massive structure of the Great Church was deemed sufficient to meet the threat. That expectation however was disappointed when in later years earthquakes destroyed parts of the church and dome, requiring massive repairs including the construction of large buttresses to support the walls which in turn held up the dome. In 1204 AD, Roman Catholic crusaders of the Fourth Crusade attacked and sacked Istanbul and the Great Church, leaving behind a legacy of bitterness among Eastern Christians which continues to this day. 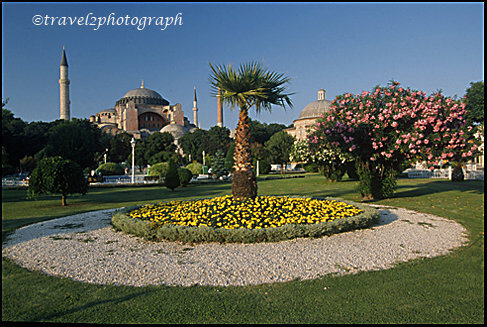 In 1453, Constantinople was conquered by the Ottoman Turks and Sultan Mehmed II ordered the building to be converted into a mosque. The bells, altar, iconostasis, and sacrificial vessels were removed, and many of the mosaics were eventually plastered over. The Islamic features – such as the mihrab, the minbar, and the four minarets outside – were added over the course of its history under the Ottomans. It remained as a mosque until 1935, when it was converted into a museum by the secular Republic of Turkey. In its prime as the Imperial church, Hagia Sofia was served by 80 priests, 150 deacons, 60 subdeacons, 160 readers, 25 cantors and 75 doorkeepers. 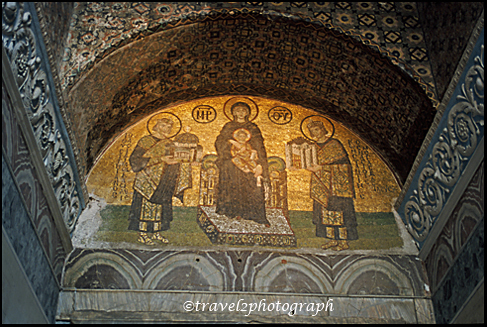 It was used as the model for other Byzantine churches throughout the Eastern Christendom. Many examples can be seen in the Slavic, Russian and Ukranian churches.